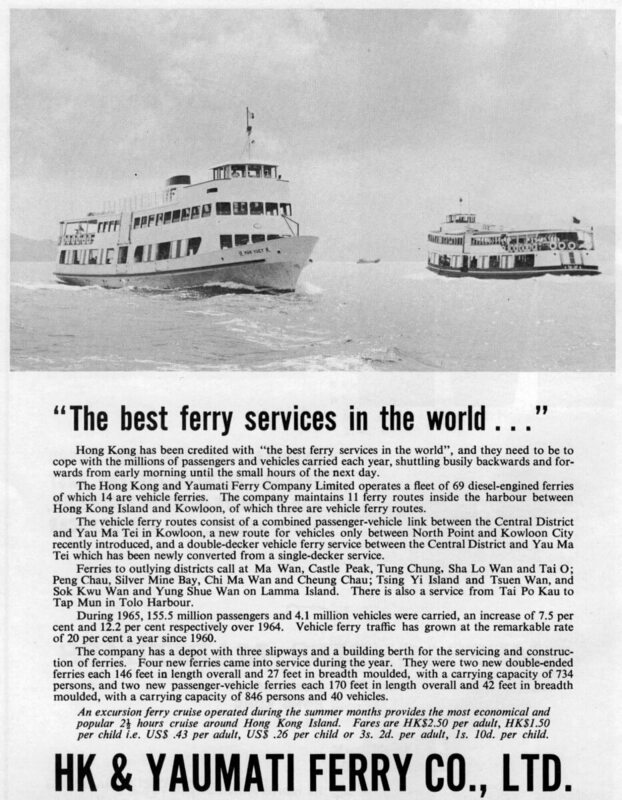 Unless otherwise stated all the information below comes from an in-house company publication, The Hongkong & Yaumati Ferry Co Ltd: Golden Jubilee 1923-1973, published in 1973. 1923 The company was incorporated on the 5th November. The Promoters of the company were Messrs. Lau Tak Po, Lau King Cho, Kwok Chuen, Chan Sau Fung, Chan Shek Shan, So Tsz Hang, Wong Choi Ho, Cheuk Ming Shan, Yue Wai Pun, Wong Kwong Po, Wong Kwong Wa, Au Yeung lu [sic] Ming, Au Yeung Tso Sheung and Chung Sau Chi. The authorised and issued capital of the Company was $400,000. Messrs. Lau Tak Po and Lau King Cho were the first joint Managing Directors of the Company. The Company successfully tendered for a franchise to operate 3 cross harbour ferry routes. 1924 The Company commenced operations on the 1st January with 11 small wooden hulled boats plying between Hongkong Central and Sham Shui Po, Mong Kok and Yau Ma Tei. Fares were First Class 10 cents,l 2nd Class 4 cents and 3rd Class 2 cents. Daily receipts amounted to about $1,000. 1925 An order was placed with the Kwong Tak Cheong Shipyard for the first ferry boat to be built for the company, the Man Ying, a single ended passenger ferry. She joined the Hong Kong/Yau Ma Tei Ferry Service. 1926 Mr Lau Tak Po applied to the Government for the construction of vehicular ferry piers in Hong Kong and Kowloon and the building of vehicular ferries instead of a cross harbour bridge or tunnel This received the Government’s approval and planning work was commenced. 1928 The Company received a franchise to operate new passenger ferry services between Hong Kong Central/Hung Hom/Kowloon City and Hong Kong Central/Hung Hom/Sai Wan Ho/Shau Kei Wan. Four passenger/vehicular ferries the Man Kung, Man Kim, Man Yeung and Man Gock were ordered from the Hongkong & Whampoa Dock Co., Ltd.
1931 The company’s authorised capital was increased to $1,000,000. Mr Lau King Cho, Managing Director passed away. 1932 In June, the Company’s issued capital was increased to $600,000 by the issue of one new share for every two old shares. The 20,000 new ordinary shares were issued at a premium of $10 making a subscription of $20 per share. At the end of the year, a further Rights issue of of one new share for every six old shares was made. The 10,000 new ordinary shares were issued at a premium of $20 making a total subscription of $30 per share and brought the issued capital to $700,000. 1933 On the 6th March, the Jubilee Street/Jordan Road passenger and vehicular ferry service commenced operations. The issued capital was increased to $840,000 by the issue of 14,000 new ordinary shares of one new share for every five old shares held at a premium of $10, totalling $20 per share. 1939 The net profit before tax and royalties amounted to $465,000, the highest record in the prewar years. 1941 The Company had a fleet of 31 vessels including 4 passenger/vehicular ferries and 2 steel pontoons. When the Pacific War broke out on the 8th December, the whole fleet was requisitioned by the Government. The Company commenced its most difficult years under Japanese occupation. * Please refer to Chapter 4 of Sham Wai Chi’s Lingnam thesis, linked below as Related Indhhk articles 1, which covers HYF during the occupation. 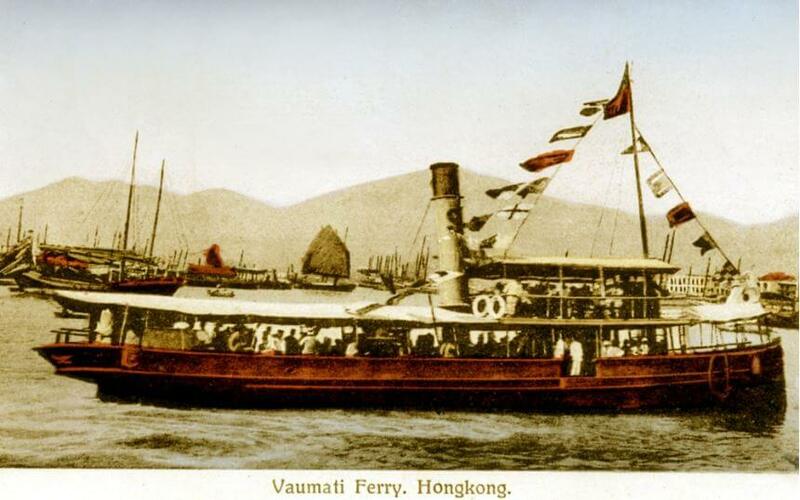 “During the occupation, the main ferry services were between Central and Tsim Sha Tsui, run by the Hong Kong Ferryboat of the Governor’s Office, as well as the urban and outlying lines operated by the Yaumati Ferry Company. Elizabeth Ride : BAAG Report KWIZ #75, 17.11.44. Fares – 1st class 80 sen, 2nd class 20 sen.
Luggage – MY2 per piece. Vehicles – Bicycle MY2, Motor-cycle MY5. Advertising in the wharf – MY100 per advertisement per quarter. The following points are to be noted: 1. No vehicles except bicycles and motor-cycles are allowed. 2. No luggage other than handbags and those to be used on the trip will be transported, unless they are for military use, or special permits have been obtained. 1945 When the war ended only 21 vessels were recovered more or less intact including two passenger/vehicular ferries. Work on salvaging scuttled ferries, tracing the rest of the fleet and reconstruction began. A decision was made to convert the fleet from steam engines to diesel engines. 1946 In mid-April the Hongkong Central/Jordan Road, the Hongkong Central/Mongkok and the Hongkong Central/Shamshuipo ferry services were resumed. As the change back to Hongkong currency resulted in a shortage of money, ferries were operated free of charge for 3 days. Sir T.N. Chau was elected Chairman of the Board of Directors. 1948 Sale of monthly tickets to adults and students was resumed. The authorised capital was increased to $5,000,000. The issued capital of the Company was increased to $1,680,000 by the issue of 84,000 new ordinary shares on the basis of one new share for every one old share on payment of par value of $10 for each new share. 1949 On 12th November the Wanchai/Jordan Road Ferry Service commenced. 1950 On 1st September the Wilmer Street/Shamshuipo Ferry Service commenced. On the 23rd May, the first passenger/vehicular ferry built after the war the Man Foo, was launched by Lady Grantham and entered service on the 1st October, 1950. A bonus issue of one new ordinary share for every old share was made. The issue capital was increased to $3,360,000. 1951 Due to a shortage of steel an order for five single ended passenger ferries was placed with the Yarrow Shipyard of Glasgow to be pre-fabricated there and re-assembled in Hong Kong. New passenger/vehicular ferries the Man On and Man Lock entered the Jubilee Street/Jordan Road Ferry Service. The authorised capital of the Company was increased to $30,000,000. 1954 Death of Mr Young Tsun Dart, Director and Manager who had joined the Company in 1925. He was succeeded by Mr Lau Chan Kwok. 1955 The Tolo Harbour Ferry Service commenced. The issued capital was increased to $5,040,000 by the issue of bonus shares of one new ordinary share for every two old shares held. Death of Mr Lau Tak Po, Managing Director and Founder of the Company. He was succeeded by Mr Lau Chan Kwok. Mr Pau Tat Fu was promoted Manager. 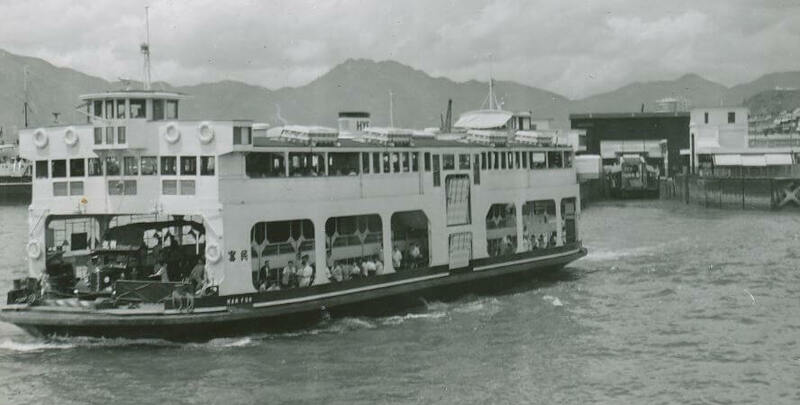 1956 On the 3rd July the Wanchai/Kowloon City Passenger Ferry Service commenced. Riots in October in Kowloon led to a curfew and to suspension of cross harbour ferry services from the 11th to 16th October. 1958 The Hongkong/Tsing Yi/Tsuen Wan Ferry Service suspended for 16 years was resumed on the 3rd July. 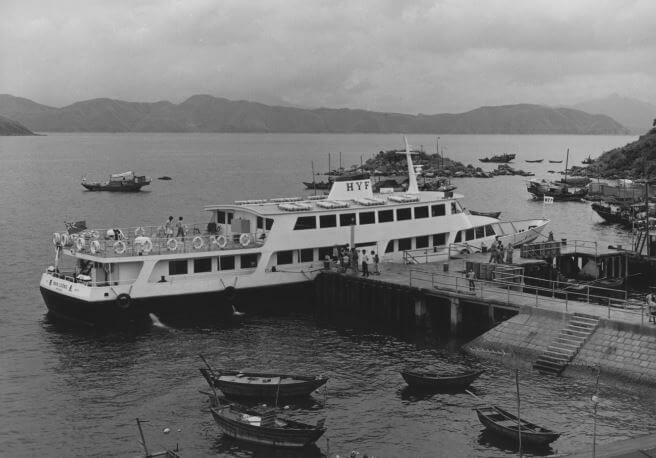 1959 The company was awarded a franchise to operate a vehicular ferry service between North Point and Kowloon City on condition that four new vehicular ferries were built. 1960 On the 15th January a temporary auxiliary vehicular ferry service commenced between Rumsey Street/Jordan Road. On the 15th June commenced a round Hong Kong Island Excursion Ferry Service on weekends. 9th March – official opening of the Workmen’s Quarters at Tai Kok Tsui Road, Kowloon, 345 units were built at a cost of $3 million. Issued capital was increased to $10,080,000 by the issue of one bonus ordinary share for every two old shares and one rights issue ordinary share for every two old shares on payment of $10 subscription per share. 1961 The number of passengers carried during the year was 102,000,000, the first time passengers exceeded the 100 million figure. 1962 On the 17th May Hongkong/Lamma Island Ferry Service commenced. Due to reclamation of the Central District waterfront, the Hongkong Central Terminal of the Shamshuipo Ferry Service was temporarily moved to Rumsey Street. 1963 4th anniversary. The net profit before tax and royalties exceeded $10 million, a new record. On the 1st September commenced a supplementary vehicular ferry service between Jubilee Street/Jordan Road. On the 12th November commenced Wanchai/Hung Hom passenger ferry service. New ferry construction comprised of Man Loong, Man Kit, Man Yuet, Man Yee, a total of seven ferries were commissioned. The Man Loong at Tap Mun (Grass Island) Ferry Pier 1975. Courtesy of The University of Hong Kong Libraries. 1964 The issued capital was increased to $20,160,000 by the issue of one bonus ordinary share for every old share held. On the 18th November the Central Harbour Services Pier was formally opened and the Central/Mongkok Ferry Service and Outlying District Ferry Services were moved to the new pier. The head office also moved from 144-148 Des Voeux Road, Central to the 1st floor of the new pier. The office staff numbered 103 persons and ferry and pier staff numbered 1,856. Three new ferries the Man Ko, Man Ming and Man Loy were completed and entered service. 1965 On the 27th January the North Point/Kowloon Vehicular Ferry Service formally commenced. On the 8th March the Temporary Vehicular Ferry Service between Rumsey Street/Jordan Road was closed. On the 23rd October double-decking of the auxiliary ferry berths at Jubilee Street and Jordan Road was completed and double decked vehicular ferries commenced operations. The new passenger/vehicular ferry Man Kwan was launched by Lady Trench on the 30th June. A sister ship of the Man Kwan, the Man Hup was launched on the 28th October. 1966 On the 27th August the Outlying Districts Services Pier was formally opened and ferry services to these areas were transferred to the new pier from the Central Harbour Services Pier. The Hong Kong/Shamshuipo Ferry Service moved to the vacated berth at Central Harbour Services Pier. Mr H.K. Long, the Engineer Superintendent for 34 years retired. He was succeeded by Mr Edward C.K. Young. 1967 Riots broke out during the year. On the 24th June the Wanchai/Kowloon City Ferry Service was suspended. In September the temporary pier at Silvermine Bay built by the Company was completed and opened for service. As from September, employees and their immediate families received free medical treatment from the Company’s doctors. The Company’s former office at 144-148 Des Voeux Road, Central was converted into a recreation centre for the Company’s employees. Mr Chiu Shiu Huen, Marine Superintendent retired. He joined the Company in 1923. 1968 On the 10th March the East and West Wanchai Ferry Piers were completed and the Wanchai/Jordan Road and the Wanchai/Hung Hom Ferry Services moved to the new East Wanchai Ferry Pier. On the 4th July the third vehicular ferry berth at Jubilee Street Ferry Pier was completed and an auxiliary vehicular ferry service commenced. Mr Pau Tat Fu, Director and Manager retired and was succeeded by Mr Edmond T.C. Lau. 1969 In October a new passenger ferry Man Fook was launched and entered service. Mr Edward C.K. Young was appointed Marine Superintendent. 1970 On the 5th October the double decking of the North Point/Kowloon City Vehicular Ferry Piers was completed and a double decked vehicular ferry service was started. A new passenger ferry Man Lai was completed in mid January. The first triple decked passenger ferry Man Shing was launched by Lady Trench on the 10th July. It entered service as a normal cross harbour ferry on weekdays, maintained the Hong Kong/Silvermine Bay ferry service during holidays and operated Round Hong Kong Island Cruises on Saturdays. In addition, it became a floating Nightclub in the evenings. On the 5th July a wholly owned subsidiary company The HYFCO Development Co., Ltd was formed to develop the Company’s properties and to diversify investments. 1971 The year’s net profit before tax and royalty amounted to $16,350,000 and the Board of Directors recommended the payment of an extra bonus dividend of 50 cents per share. On the 12th January the North Point/Kowloon City double decked ferry piers were formally opened by the Director of Public Works Mr J.J. Robson. On the 31st March the second triple decked passenger ferry Man Ping was launched and joined service. She took over Nightclub cruises from her sister ship the Man Shing. Cantonese cuisine was served on board. On the 17th August Typhoon Rose inflicted heavy damage to the Company’s fleet and piers. 1972 On the 12th February the new Kwun Tong Passenger Ferry Pier was formally opened and the North Point/Kwun Tong Ferry service moved to this new Pier. On the 22nd April the new Tai Kok Tsui Passenger Ferry Pier was officially opened and the Hong Kong/Mongkok Ferry Service moved to this Pier on the 23rd April. On the 29th April the Company’s largest ferry the triple decked passenger ferry Man Kin was launched by Lady MacLehose. It replaced the Man Ping on nightclub cruises. On the 1st May the Hong Kong Central/Kwun Tong passenger ferry service commenced operations. On the 11th May the Company was granted licences to operate two passenger ferry services between Shau Kei Wan and Sam Ka Tsuen and Shau Kei Wan and Kwun Tong. In August the Cross Harbour Road Tunnel was opened to traffic with adverse effect on the Company’s operations, This was anticipated and the Board had made plans for diversification. On 11th September another triple decked passenger ferry the Man To was launched by Mrs A. Fletcher, wife of the Director of Marine. On 27th December HYFCO Development Co., Ltd., the Company’s wholly owned subsidiary purchased the Hong Kong Shipyard. On the 12th April the triple decked passenger ferry Man Tack was launched by Mrs P.C. Haddon-Cave, wife of the Financial Secretary. On the 14th April the authorised capital of the Company was increased to $100,000,000. The issued capital of the Company was increased to $60,480,000 by the issue of 2,016,000 bonus issue ordinary shares of one new share for every old share held and a rights issue of 2,016,000 new ordinary shares of one new share for every old share held on payment of $15 premium making a total subscription of $25 per share. In April the Company’s thirteen storey HYFCO Industrial Building Stage 1 at Tai Kok Tsui was completed and fully let. The Company entered into the fibre glass era. In May two fibre glass hulled water buses the Man Wo and Man Loong were delivered. A third water bus was purchased and named Man Ning. The first water taxi the HYF 1 built by the Hong Kong Shipyard Ltd entered service. On the 2nd July the Shau Kei Wan/Sam Ka Tsuen and Shau Kei Wan/Kwun Tong passenger ferry services commenced from temporary ferry piers built by the Company at Shau Kei Wan and Sam Ka Tsuen. This article was first posted on 20th March 2017. I am grateful to all who contributed to keeping this remarkable story for posterity. It is an important aspect of the modern history of Hong Kong that illustrates how a key public utility survived the harsh conditions of WWII under Japanese occupation and then prospered as part of a duopoly under the private enterprise lassez-faire British system at the time. Much of the prosperity of Hong Kong today is thanks to pioneers like these men. As the son of Pau Tat-fu (aka Bao), the Manager from 1943-1969. I have known many of the players mentioned in this article including three generations of the Lau family, Mr. Long, the colorful Engineering Superintendent originally from New Zealand, whom I believe, had an artificial leg and Mr. Chiu, the Marine Superintendent who never wore a shirt and tie but stuck to the more comfortable Chinese attire as did Mr Lau senior, the founder, both from 1923. They brought back very nostalgic and personal memories of my youth as well as the difficult times under the Japanese occupation with the Allied carpet bombings, the typhoons as well as the riots in the late 1960’s. Times when my father worked 12+hours days 7 days/week and we hardly saw him at home. In hindsight, it is interesting to note that in 1967, near the end of my father’s long career, the company started providing free health care to all its employees and their families by the company’s doctors. This helps to explain the large contingent of workers and union reps who came his funeral. It is an extraordinary achievement for a self-taught man with just a grade school education in Yokohama, managing a company which ferried 155 million passengers and 4 million vehicles in one year alone (1965).